Financial Advice Newsletter | Prospect Money, Lee-on-the-Solent, Hampshire. 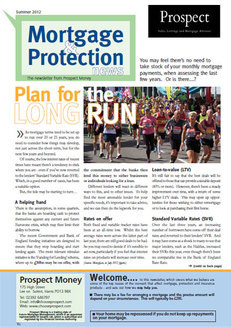 'Mortgage & Protection News' - from Prospect Money. Click for Example Newsletter - 'Summer 2012'. Pre-empt or even avoid dissapointment with your Mortgage and Insurances. Our newsletter informs & advises you on current issues likely to affect you and/or your family - from 'Free Advice & Tips' to latest legislation, view our example Newsletter. Subscribe - Simple & Free! ... complete our form (on the right). Unsubscribe: At any time, simply click the link at the footer of the e-mail we send you - it's that simple. No Spam! We'll not pass your e-mail address on to anyone else! An example of the insights you'll gain from our Newsletter can be seen via the following summary of our Summer 2012 example Newsletter. Article: 'Plan for the Long Run' - Advises you to get-in-quick on your mortgaging concerns, as your borrowing options will be affected, due to current suggestion that some Banks' ability to borrow may be limited moving forward. Article: 'Are men & women equal?' - Advises that if you're female, it's likely worth taking up Insurance & Protection cover prior to likely increase for Female Term Life Policies (may increase 10-15%) due to recent European Court of Justice ruling. + 5 steps that'll help you if you're a budding landlord. Article: 'House Selling Ideas' - How to get a faster Property sale according to stats. Top 3 ideas, of the 8 inside the issue, are: 1. De-clutter your home, 2. Repair Paint/Wallpaper, 2. Cut Grass & trim Flowerbeds. Article: 'Is it time to consider your Mortgage options?' - Helping you decide via a 2012 rule of thumb rates table. Article: 'Critical Illness' - Explaining how there's an increased probability you'll need cover - The stats mentioned for this period show you such. So, do take a look at our Example 'Mortgage & Protection' Newsletter.